This review deals with "Plants vs. Zombies: Garden Warfare", a game that has become one of my favorite all-time games. 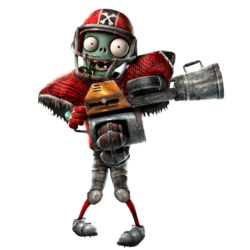 It is first and foremost an "online-only" third-person shooter, where you can take sides in one of the two rivalling factions: the PLANTS, or the ZOMBIES. Each faction in turn consists of four classes, i.e. characters with different talents and abilities. By now, those of you who played "Team Fortress" will find this type of game familiar, and indeed, a number of things in this game are based off "Team Fortress". But still, there is also enough material which is new, and which I will get back to below. For now though, I will start with the character classes. On the PLANTS side, we have from left to right, the peashooter, the sunflower, the cactus and the chomper. 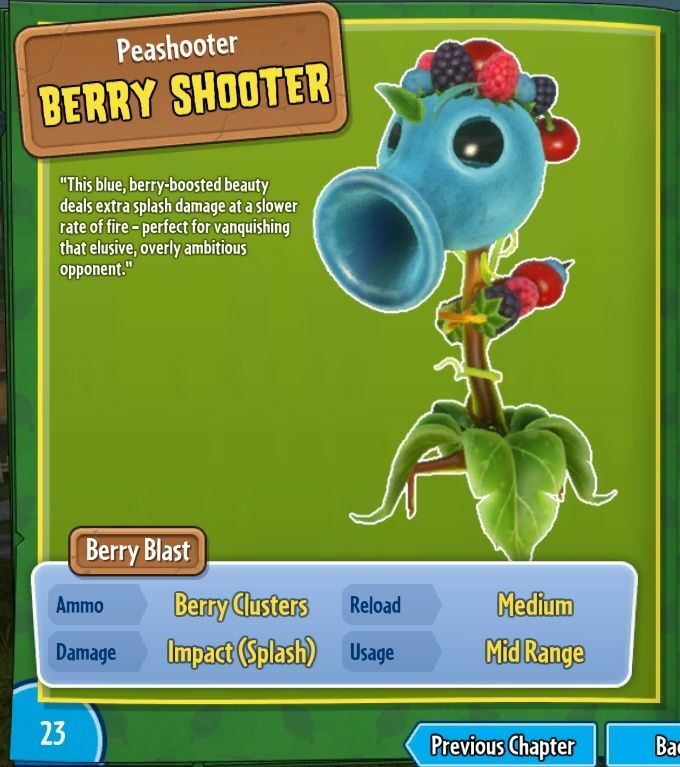 As the foot soldier of the plants-group, the peashooter is tasked with front-line combat. Players with good aim & dynamic movement patterns will like the character very much, but it is also liked by beginners too, because of the relative simplicity involved in mastering the peashooter. The sunflower is the medic in the plants-team. She has the ability to revive fallen teammates very quickly (quicker than the other plant classes) and also heal teammates. Beyond that she also has offensive capabilities, albeit her weapons are not as strong as those from the other plants. 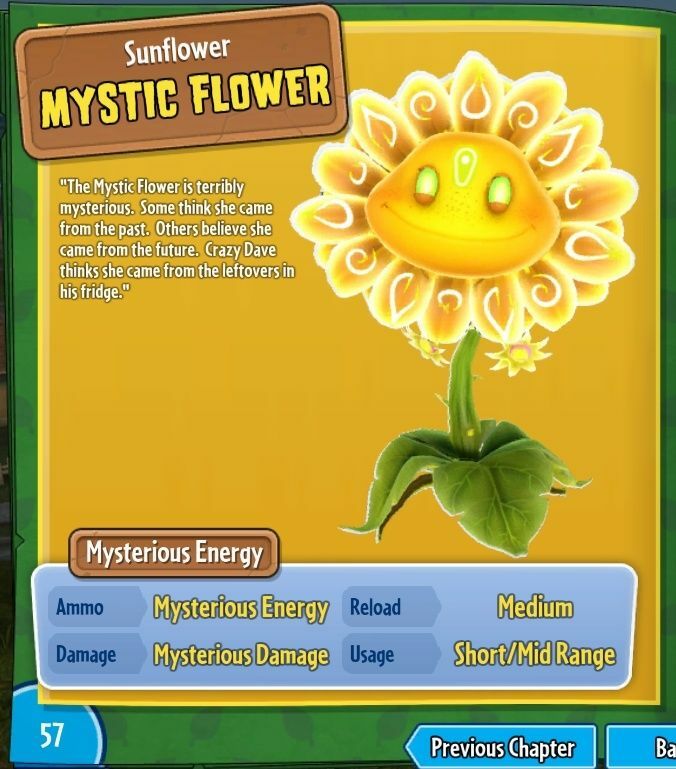 The sunflower is hard to master in my opinion, and you can recognize a good player by the fact that he or she not only manages to heal & revive other plants quickly, but at the same time also manages to inflict casualties on the enemy faction (the Zombies). 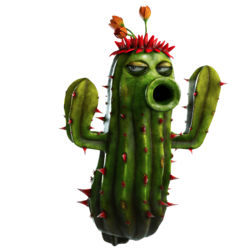 The cactus is the sniper of the plants team, and also a sort of "combat engineer", given the fact that she can plant different types of obstacles, like mines or blockades, which can obstruct the enemy's movement. As a sniper, this character is suited for longer range combat, and not so much for close quarter encounters. As a player, you will need a good deal of tactical knowledge, stealth and judgement to master this character. 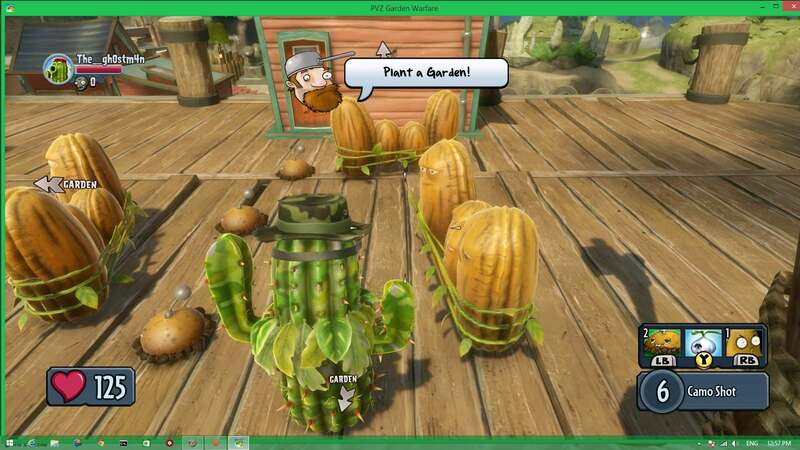 And as an addition, the cactus can also control a mini drone, that can harass opponents with gunfire and airstrikes. 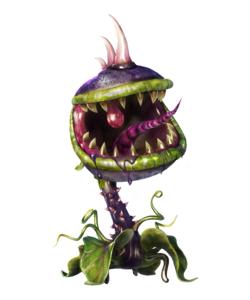 The chomper is the "big guy" in the plants team and the close quarter combat specialist of the plants team. He has the highest health count of all plant classes, however, he can only deliver short range attacks. And if the Zombies shoot him from afar, he cannot shoot back. He can swallow zombies from behind, instantly killing them. And he can also dig into the ground and swallow a zombie from below. The chomper is from all playable characters in-game BY FAR the hardest to master in my opinion. Not only do you need to be very good on an individual level, but you also need to at least make some attempt to coordinate your attacks together with the rest of the plants team. Excellent map knowledge, good stealth and superb tactical judgement will be necessary to master (and fully enjoy) this character. I daresay, you need to have these abilites much more urgently, than with the rest of the plants. Beyond that, you must not be afraid to confront multiple zombies (in close quarters) at once, in order to slow down the advance of zombies for instance. And in case you were wondering: unlike real-life plants, these characters can all actually MOVE, yes. On the ZOMBIES side, we have from left to right the foot soldier, scientist, engineer and all-star. 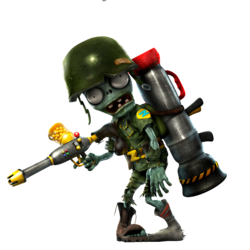 The equivalent of the peashooter on the zombie side is the foot soldier. He is capable of jumping up to elevated places like rooftops, and able to assist with semi-sniping capabilities. 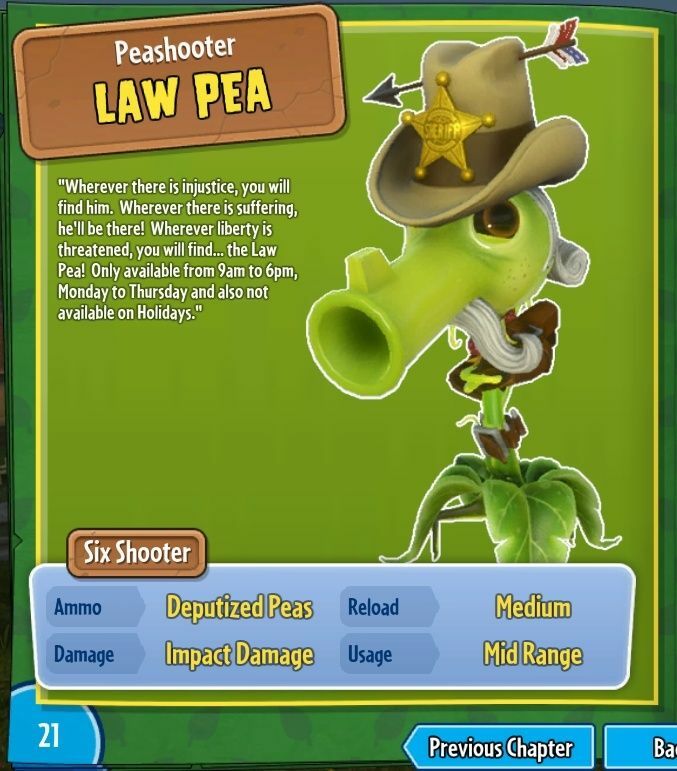 Similar skills for the peashooter are necessary for the foot soldier too, but maybe with the difference that the foot soldier might not have to be THAT dynamic as the peashooter. But then, it depends on the player skills how to "interpret" the role, not only of the foot soldier, but with all other characters in general. 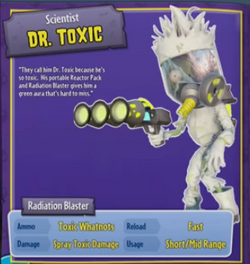 The scientist is the medic of the zombie team. 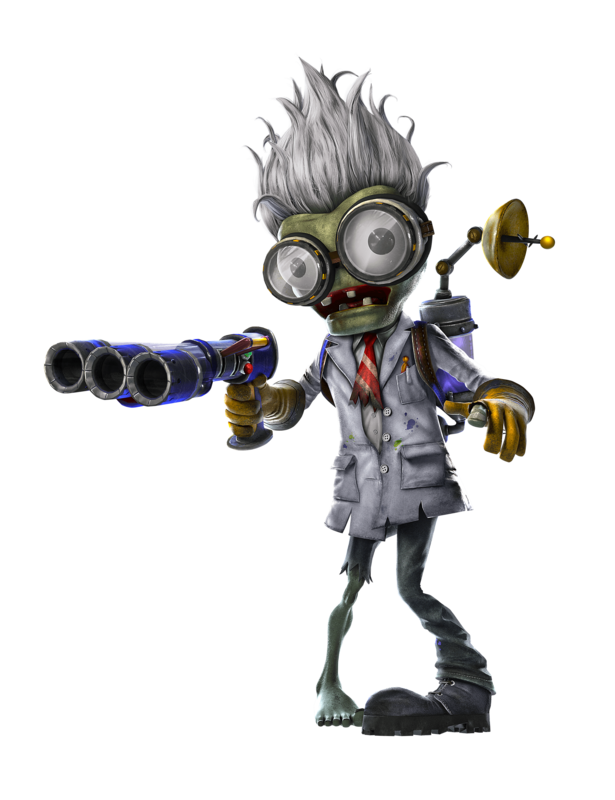 As with his sunflower-foe from the other team he can revive teammates faster than other zombies and also heal them. However, the scientist gun has a very short range, so you will need to be comfortable with close quarter fights with this character. The engineer can build teleporters for teammates (in the gamemode "Gardens & Graveyards" only) in order to help the advance his teammates. He has the ability to "stun" enemy plants for a little while - depending on the exact loadout of him - and kill the plants more easily. 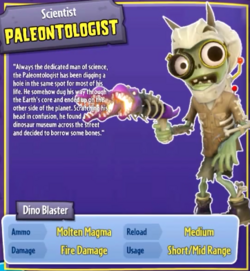 Also, he has the ability to "ride" on a jackhammer for a limited amount of time, which is especialy useful when confronting chompers, as they will then be unable to swallow an engineer. The all-star is the big guy from the zombie team. The base form of the all-star looks like an American football player, and he has a weapon that fires footballs. Those of you who remember Team Fortress 2 will notice the similarity with this big machine gunner there. The All-star's weapon does not need to be reloaded, but it can overheat if fired for too long. This character can be used for support fire from mid-distances. 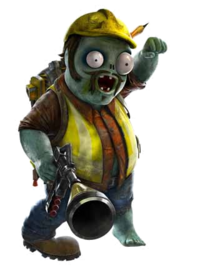 Two additional characters should be mentioned too: "Crazy Dave" (for the plant team) and "Dr. Zomboss" (for the zombies, second picture). They appear as supportive characters and can assist their teams from the sky, with different things, like airstrikes, heal stations and other things. Only one player in a match can choose to become either Dr. Zomboss or Crazy Dave. 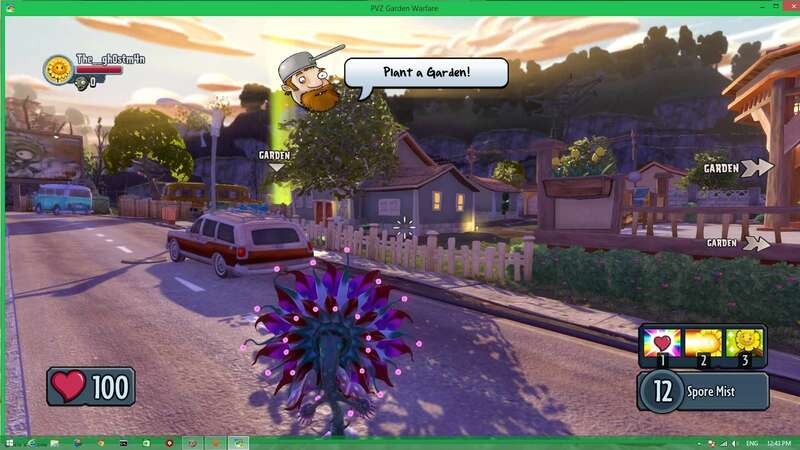 Noteworthy is the fact that the plants and zombies team cannot be "directly" compared. 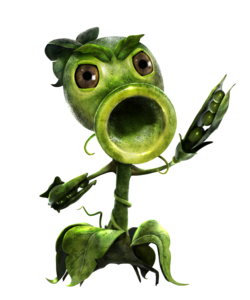 For instance, while the peashooter is the foot soldier's equivalent, the peashooter is not 100% the same as the footsoldier. 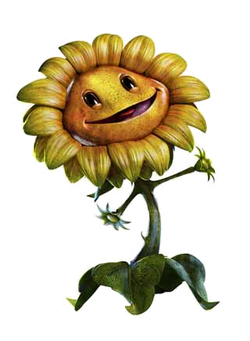 Likewise with sunflower vs. scientist: they are not 100% comparable, as the sunflower should mainly be used for longer-distance support fire, and the scientist is generally useful at shorter distances only. 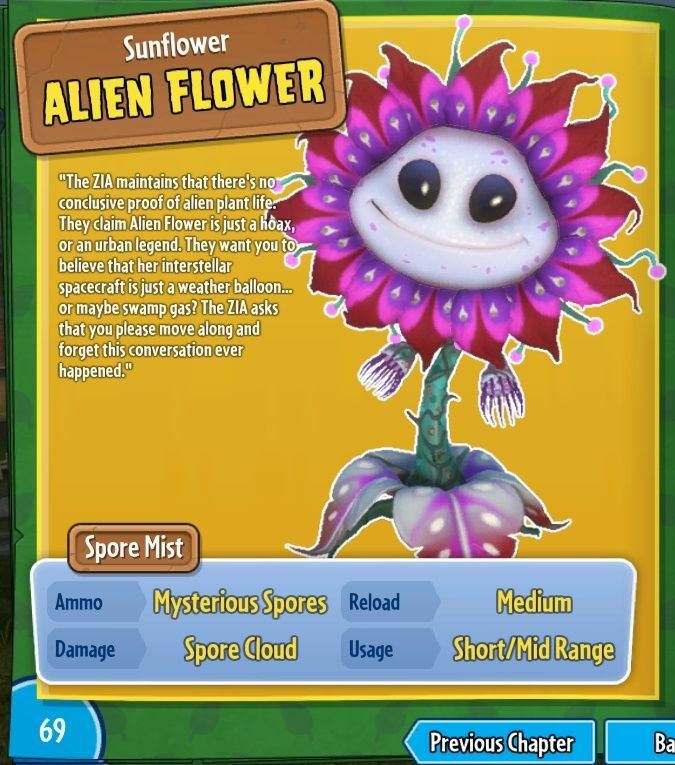 It would be beyond the scope of this post to go into all details, but the game thereby creates a very interesting type of balance between the plants and zombies factions. Which for me made the game definitely more interesting than just the thing with "team red" and "team blue" from Team Fortress 2. There are game modes in which players can "spawn" Helpers. For the plants team these include special plant pots that mainly serve as stationary cannons, and for the zombie team there are "summonable zombies", which can move. Depending on the type of summonable zombies or potted plants that are used by players, they can also have a significant impact on the game. These "Helpers" are available from the "Sticker Shop" - see below under 4. Sunflower variations include the mystic flower, metal petal and alien flower. And finally a few variations for the "scientist"-class among the zombies, those scientist variations that I most often play with when on the zombie team. The in-game descriptions often don't give away too much information about the specialties of each character, so that you might want to check the internet for any further details on several characters (if you are new in this). Which is a small weakness of the game, but OK. But don't just think that because characters need to be unlocked, they are necessarily better than the base form of a character class. 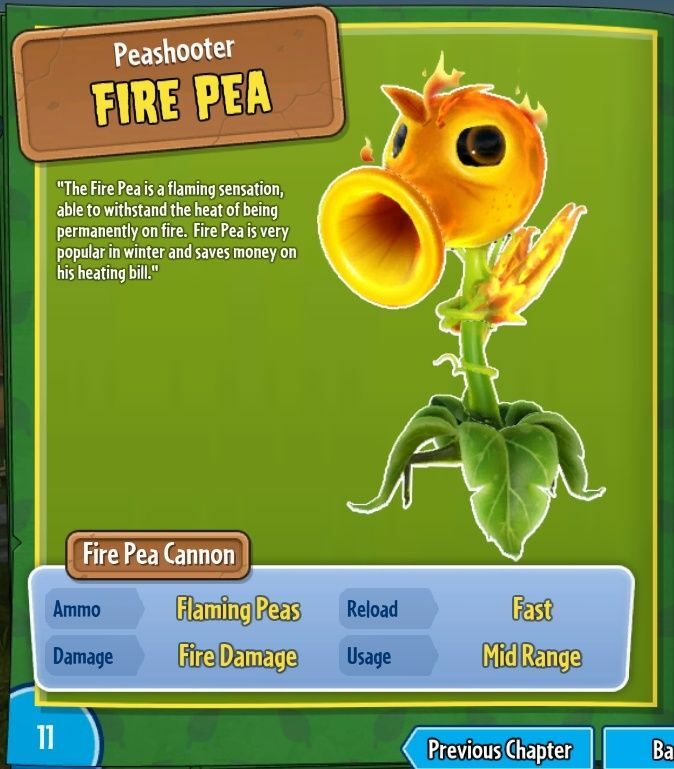 For instance, you cannot simply say that the "fire pea is better than the regular peashooter". It all depends on the circumstances, your personal skills as well as your ability to fight alongside other teammates. In theory, every character is good, and people will need to learn how to use them properly. If you ask me, my absolute favorite from the peashooter class is the regular one. Other players in turn might feel more comfortable with other peashooters. These character variations, as well as the weapon upgrades and any customization items, are for the most part hidden and need to be unlocked by opening "sticker packs" in the in-game sticker shop. 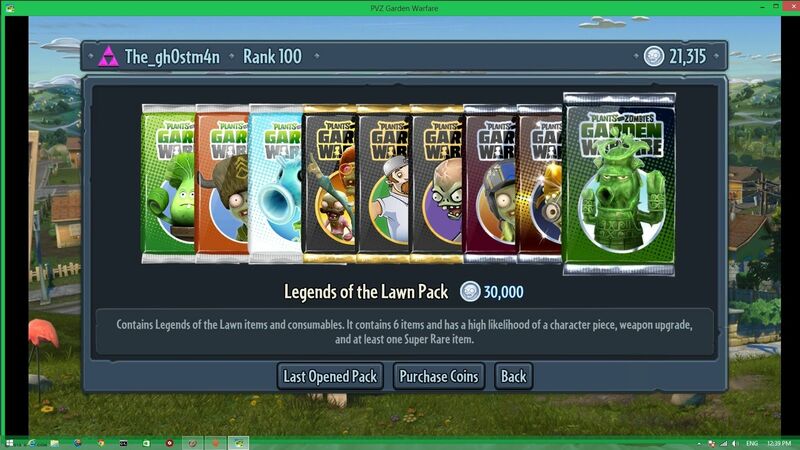 You can earn those coins by playing multiplayer matches or even with the co-op mode "Garden Ops" (see my first screenshot, at the beginning). However, as you don't get as many coins for the co-op mode, you might want to prefer the multiplayer battles. In addition, there are "micro-transactions" with which you can buy in-game coins, with real-life money. I myself have earned all my coins and unlocked all the characters and their weapon upgrades, without spending money on these transactions. This is a screenshot of said sticker shop. What might be seen as dubious is the fact that you get random stuff if you open these sticker packs. But then, it also ensures that people keep on working to unlock characters. And, if you really want to unlock all characters plus weapon upgrades + customization items, without spending money on micro-transactions, you need to play for a very long time. This might be frustrating if a player doesn't have enough patience, but I myself wanted to "play my way up" right from the beginning. If you really spend (lots of) real-life money to buy these coins, and hence unlock stuff, the game will get boring very quickly. If there is an opponent by the house (right arrow) and I am in the position as show in the screenshot, my ammo won't hit him. Instead it will hit the tree trunk. Owing to the third person perspective (in my opinion) the line of sight does not always match with what the crosshair shows, making it a bit hard to take cover behind obstacles and shooting from there. A mistake, that is especially often done by beginners in the game. The 3 small boxes that you see in the bottom right of the screen (marked with 1, 2 & 3) are the special abilities of each character. For each slot, you have one particular type of special ability, and possible "variations" to it. For example, here in "2", there is the "sunbeam ability", which is basically a devastating laser beam that you can fire on enemies. There is a variation of it that is even more devastating, but the energy runs out faster (meaning the quantity of that stronger laser is smaller). The set of abilites is customizable for each character, in most gamemodes. It would have been an interesting thing if you could choose more than one ability of a type. 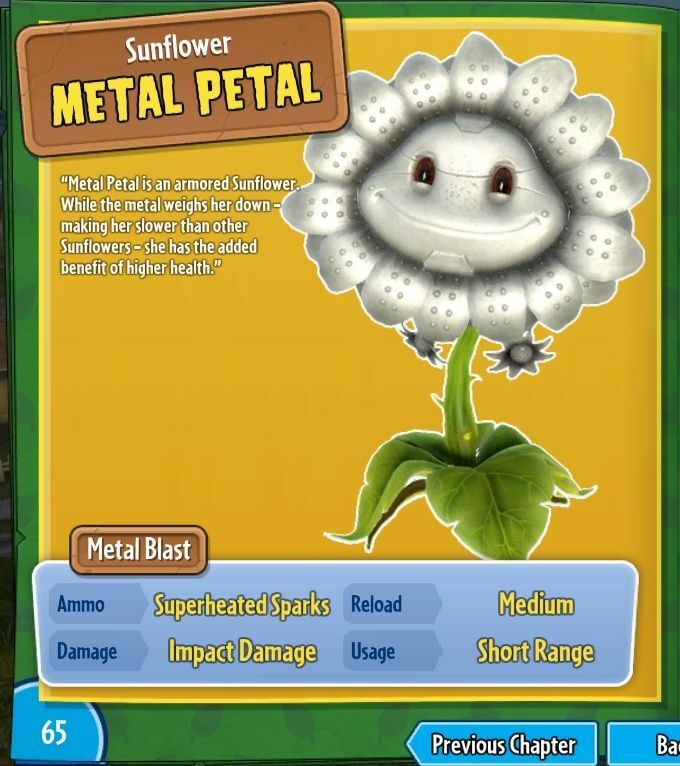 Here for the sunflower, it would mean that you could choose both types of laser beams, and instead leave out one of the (remaining) healing ability slots. 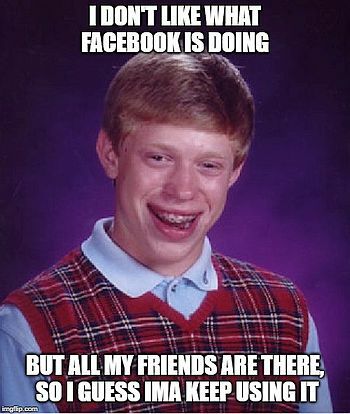 But the way it is, it's fine too. I guess this idea was not carried out in order to avoid certain characters becoming too overpowered, by allowing them to select loadouts that are "too good". Another interesting feature of these special abilities is the fact that with some characters, some of the abilities will trigger with a delay of about half a second or so. While that doesn't sound like much, in emergency situations it can make a huge difference. For instance, the scientist has an ability to teleport himself. If you wish to use this in order to escape from opponents, you will find a delay until the ability sets in. While this may make the game harder to play, I find it good in a way, because success then not merely depends on how "fast" people react, but the aspect of anticipating dangerous situations will be fostered that way, in my opinion at least. Also, a disadvantage is that on the PC version, these 3 buttons to trigger the abilities are not so easily "accessible". Oftentimes you will need to trigger those abilities in a matter of split-seconds (in emergency situations). And occasionally, even experienced players could thereby press the wrong buttons. Those of you who are familiar with PC shooters in general will know the default W-S-A-D combination of keys. Now add into that the fact that you need to access the buttons 1, 2 & 3 in certain situations. Sounds easy ? I'm not sure. In many other games, you have 3 weapon slots, that you can cycle through them with the mousewheel, but here that wouldn't work, as the abilites are meant to be "triggered" and after a one-time use, they need to recharge. The principle of these special abilities is interesting but in the end, only poorly optimized for PC gaming in my opinion. I've seen players trying to re-configure the key-bindings or even use special gaming mouses with extra buttons, but still it's sad that players have to resort to these methods. You can theoretically also play the game with an XBOX controller on your PC, though I honestly don't recommend it. Those of you who played shooters on the XBOX or at least with an XBOX controller connected to a PC, will know what kind of pain it is to aim properly. As you can see in the screenshot though (and if you are familiar with the XBOX), the "LB", "Y" and "RB" buttons show up for the special abilities, by default. In my opinion, these abilities are more easily accessible on a console controller. Indeed, it appears that the whole game was originally intended for consoles, which is also a small weakness. Finally, I also like the aspect of "creativity", which in my opinion is especially the case when using the cactus. The obstacles you see in the screenshot can serve as barriers to slow enemies down, as light cover when shooting from behind them, and as steps so that you can maybe jump up on more elevated positions. This is the view from the cactus's "garlic drone". It can serve for reconnaissance flights (only relevant though if you play with a bunch of friends and can communicate with them via headset), and can shoot enemies with an arguably strong board cannon. I myself mostly use this drone for the so-called "corn artillery strikes", which are basically powerful aerial bombardments. the disadvantages are that it can only stay for a limited amount of time in the air and literally cannot take much enemy fire, in order to get destroyed. 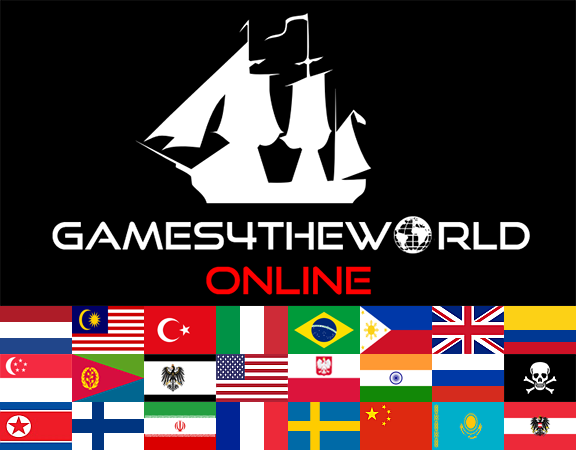 One of the game's main weaknesses in my opinion lies in the fact that it is a "multiplayer only"-game. Obviously, that was done to make it very hard to crack the game, but it also means that if there is a server problem on EA's end, you will notice this by the fact that the screen gets black, and any current matches you play in will end abruptly. On a positive note, any progress that you made until then, like earned coins or achievements, will (usually) be saved, owing to the "permanent internet connection" of the game. Another in-game weakness is the relatively small number of maps. While I do like the graphics of the game very much, and the current maps are well-made and offer a lot, there are "not so many" maps. But beyond that, I find it a very fun game to play. There are good character classes and variations, with characters that will appeal to a lot of players with different talents. Do you love going into aggressive combat ? Choose a peashooter or soldier. Want to help more as a supportive character ? 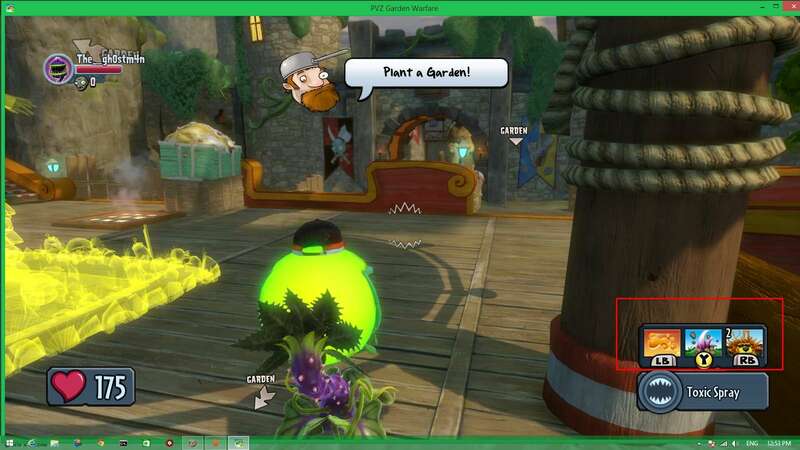 Then choose either the sunflower or cactus on the plants team, and the engineer or scientist on the zombie team. The game modes themselves are also OK, and include different variations of what in other games may be known as capture the flag/base ("Gardens & Graveyards", "Suburbination", etc. 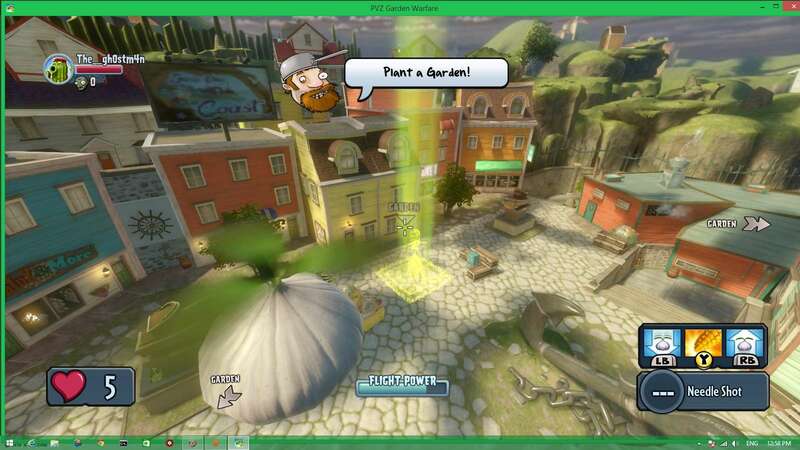 ), deathmatch modes ("Team vanquish", "Vanquish confirmed") and combinations of bomb defusal and/or VIP protection scenarios ("Taco bandits", "Gnome bomb"). Maybe a campaign-like storymode could have been added too, but then, sadly (?) nowadays everything is heavily focused on multiplayer stuff only. Lovely graphics and a humorous packaging also add into the overall impression of a well thought-through game. Something, that is different from the "usual" COD, Battlefield and whatnot. What my favorite classes are ? On the plants team, I actually like all characters, but on the zombie team, I usually prefer either the engineer or the scientist. 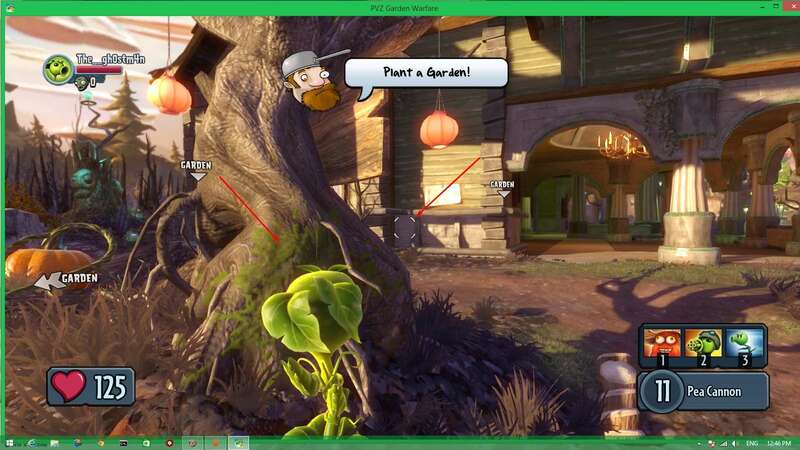 Re: Plants vs. Zombies: Garden Warfare. That usually happens for me when I try and play very late at night, on weekdays (when I am awake, and try to play). This game does not allow you to choose a server, unlike most other modern shooters. Instead, you "get assigned somewhere" - I assume to a server that is near your geographic location, but then I can't really tell. Mostly though I play on afternoons, and the servers are still alive and full. I wonder though, if EA decides to close down those servers at some point, are they going to release a final patch of some sort, that will allow players to host their own game servers ? Or will they just let the game "die in oblivion" ... ? Only time can tell I guess. Doubt it. But I also doubt they'll close them anytime soon. Carlos wrote: Or will they just let the game "die in oblivion" ... ? Only time can tell I guess. Isn't that what happened to Modern Warfare 2? @Anarchy wrote: Doubt it. But I also doubt they'll close them anytime soon. Agreed. The game is *still* too fresh to be closed down. Let's see if they add more content to this though, or do something similar like with Call of Duty (where a new title is rehashed every year). Admin wrote: Isn't that what happened to Modern Warfare 2? I actually can't tell. In the end though, those CODs/Battlefields and whatnot are just treated as mere products that are thrown away once they are not profitable anymore. This game here can be seen as different, not just because of the looks and the "packaging", but also because it is still challenging enough, even for those who played shooters before. Whether that's going to be for a completely new title or the current one, remains to be seen. Anyhow, I'm planning to do more of these posts over time. The next one is probably going to be about "Saints Row: Gat out of hell". Really fun game. I play it on my PS4! @MilosGamerSRB wrote: Really fun game. I play it on my PS4! And I'm actually surprised that there is still a lot of activity left in the game (at least on the European PC servers), but I only play irregularly these days. Also, despite the release of Plants vs. Zombies: Garden Warfare 2. 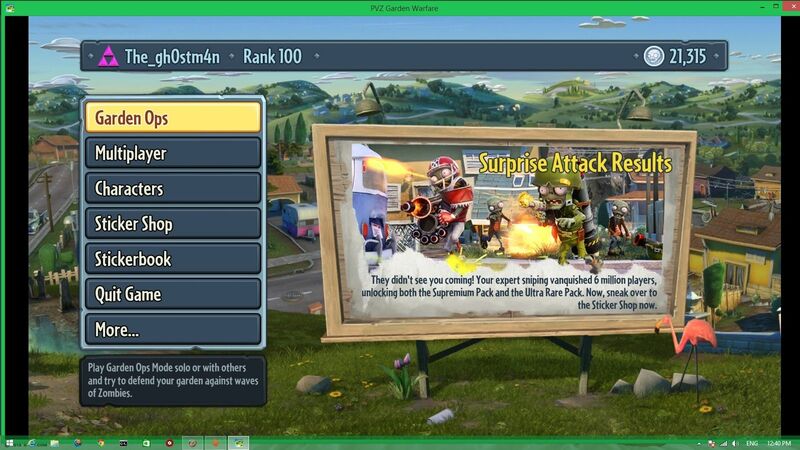 I actually played the second Garden Warfare a bit, but...didn't like it too much back then. Mostly the map design is meh, but oh well.